Just tried out this recipe from a book I borrowed from the library. The proving process is very long. I proved the starter dough for about 20 hours. 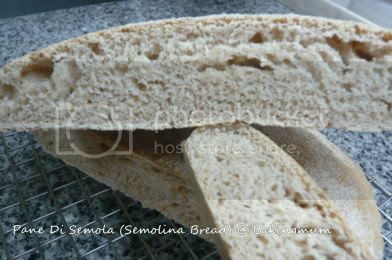 Then mix with flour, and wheat flour (supposed to be semolina flour but I chose to use wheat flour) and other ingredients. Then shaped and proof for another 1.5 to 2 hours. Then divide dough out and shape and proof for another 1 hour (supposed to be 1.5 hr though). Verdict: The bread is qutie tasty. The crust is really crispy which is what I like. While hot, I applied some butter and jam on it. Ummph ... yummilicious! Note: I suspect I should have proved it longer than an hour. I should have shaped the bread a little rounder instead of so flat. 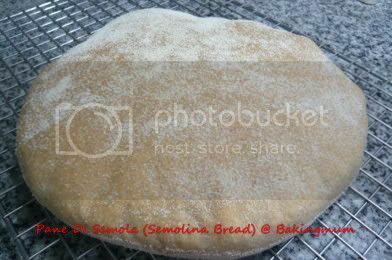 have u ever tried making 65C tangzhong bread? is it took so long to prove? Hi YooLee, I have not tried it before but I understand that this type of bread comes out very soft. wow. your baking looks delicious! i'm thinking about making those macadamia cookies below, because they look so good. Hi Mestiza, you can use my sweet bread dough recipe to make the pork floss bun like those sold at BreadTalk. After proofing the bun, bake it as per recipe. After it has been taken out of the oven, apply a thin layer of mayo on top of the bun. Coat the bun with pork floss.